Cube is working on the udp download rate with high packet loss. Michal and Vaclav are tweaking the flamethrower mechanics (You will like this one). Robert is working on the circuit network improvements. Tomas is working on the authentication service. Albert is preparing the new train graphics which will solve the horizontal/vertical inconsistency explained in the last Friday facts. Ondra is implementing control interface of the headless server and Martin is mainly cooperating on the integration of the mod portal. Most of these topics will be described in detail in a future Friday facts once they are finished. Miska is our now project manager on a testing period. We (Tomas and Me) decided to delegate some of our responsibilities to someone else, so we have more time for programming and game design. Her responsibilities will be to keep the track of the ongoing projects in Wube, help us to optimize our working processes, help with administrative and business tasks, possibly help us to optimize the bug fixing process and other similar tasks. Let me explain the process of a small task I decided to do during Sunday afternoon for 0.13, which grew to a week of work. So the first obvious step was to show the possible positions of the signal placement, to spare the player searching for those by moving the cursor around. The indicator shows only positions around the cursor (20 tiles radius) and it looks like this. 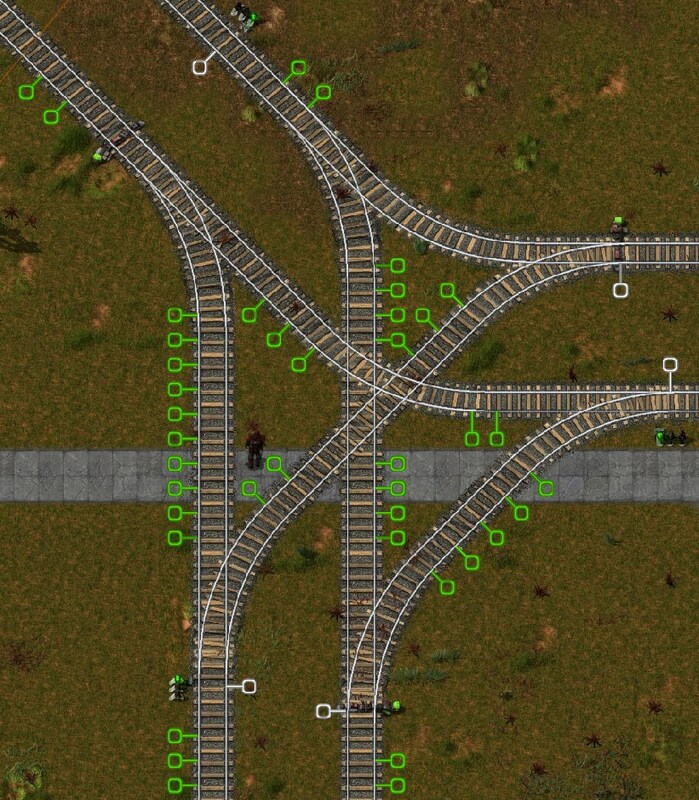 Signals as well as junctions always divide rails into segments. A segment is a rail with one beginning and one end, with no junctions and these segments are grouped into blocks. 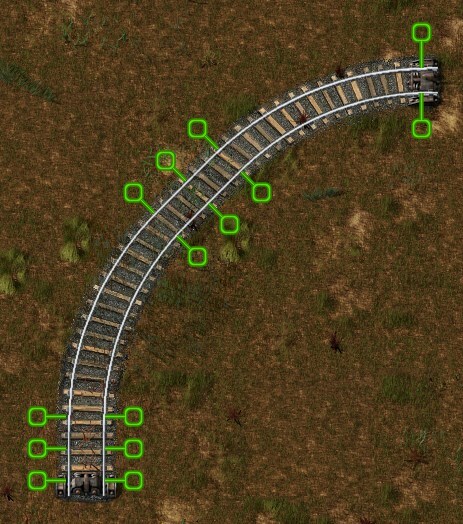 Two distinct blocks need to have signals on the border with the other blocks, and can't have any collisions with rails of another block. 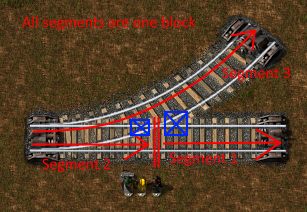 This is to make sure that a train on one block can never collide with a train on another block. 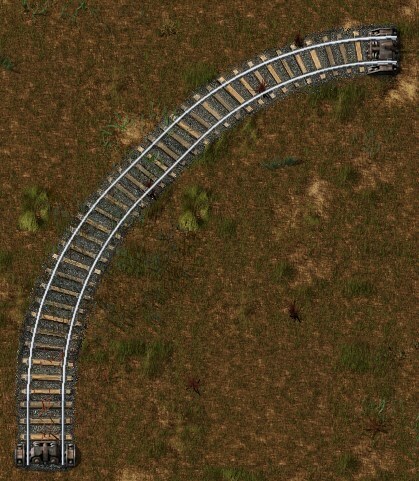 The problem with the junction, is that the curved rail collides with both the left and right segments, so it merges all of the segments into one block. This renders the signal to be useless, as it is not dividing anything. From the little testing I did, this is going to be one of those changes that will make us wonder, how could we play without it before?